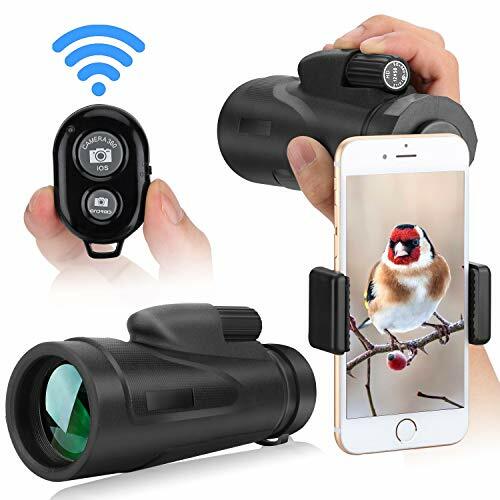 12X50 High Power Prism Monocular, equipped with FMC(fully multi-coated) green film lens and clear BAK4 prism, is a good addition for any outdoor enthusiast, perfect for sightseeing, sports games, hiking, hunting, climbing, bird watching, watching wildlife and scenery and other outdoor activities. Can be connected with phone to take pictures. Observe far objects withwider view and truer details. Wide range of use. For sightseeing, sports games, concert and shows,hunting, bird watching, watching wildlife and natural scenery and other outdooractivities. Wipe the lens with dry and clean cloth. If there are some stubborn stains, please use the cloth dipped some alcohol. It would be easy to remove. Comfortable Convenient: Rubber armor makes it comfortable for use and keeps it from slipping out from your hand. Compatible with 8plus, 8,7plus, 7,6, 6s, 6plus, 5, 5s, 4s,SE, Samsung GALAXY S8, S9,S6, S6 Edge, S5 , Note, LG, HTV, Sony, and more. High Quality: Large BAK-4 Prism inside and Fully Multi-coated Lens Coating - Strengthen the key function of a monocular, guarantee superior light transmission and brightness, make your view brighter, clearer and delivers crisp images. Water-proof, Dust-proof and Shockproof Design : Prevents moisture, dust, and debris from getting inside the monocular designed to inhibit internal fogging. Great for any weather and any environment. Shockproof is good for your children to play and do not worry about broken. Solid Framework and SATISFACTION : Its durable framework make it usable to withstand the toughest weather conditions. 365 days warranty, perfect after-sales service. If you have any questions about this product by CCX, contact us by completing and submitting the form below. If you are looking for a specif part number, please include it with your message.